Every maker has a story. Be a part of Sparkle Pow's story by placing an order, leaving a review, and seeing your review appear here. 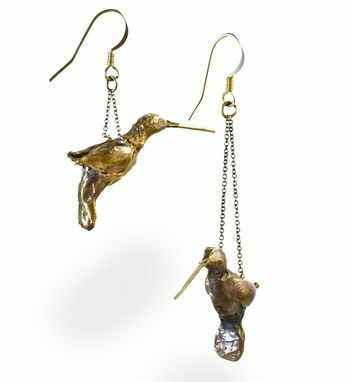 Beautifully hand carved and cast hummingbirds hanging from sterling silver chain and 14k fill earwires. When I make this wearable art jewelry for a client- I consider it a collaboration and work to really get what people are drawn to and interested in. I end up feeling like a channel- and it seems that what ends up getting created comes through me and is able to reach the visions and desires of my client, both physically and spiritually. It is my deep pleasure to work in these kinds of relationships.